Pro Soccer Player From Tijuana Charged With Smuggling 48 Pounds Of Meth Into U.S.
A professional soccer player for a club in Tijuana, Mexico, called Xoloitzcuintles, was arrested at the U.S. border last week and has been charged with trying to smuggle 48 pounds of methamphetamine in to the U.S, according to court documents. 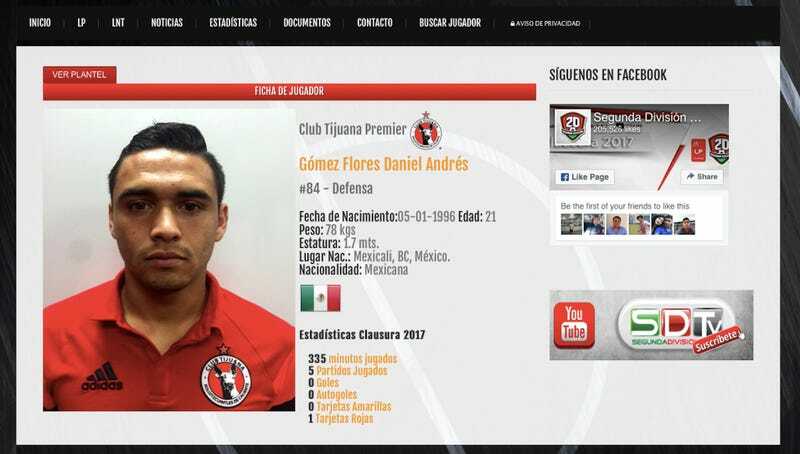 Daniel Gomez Flores, a 21-year-old defender for the club’s second team, was arrested on April 5, when Customs and Border Protection agents found packages of drugs in his car. Gomez, who has U.S. citizenship, arrived at the Otay Mesa port of entry at 4:52 a.m. in his Chrysler Sebring. He told the agents he was traveling across the border for breakfast at Denny’s (about a 30-minute drive from Tijuana), and then planned to return for soccer practice at 8 a.m. The initial inspection of his car revealed a spare tire that weighed more than a normal spare tire and when an agent pressed on it, he felt hard spots, court documents said. An X-ray of the car showed anomalies in the tire. During further inspection, an agent cut open the tire and found 23 packages of “clear crystal-like substance that field-tested positive for methamphetamine.” Two days later, authorities found additional packages of drugs in the panels of the car, according to the documents. During an interview with agents, Gomez said he didn’t know anything about the drugs. He said he had traded his car with another person about three months ago in exchange for their car, but decided to trade back about a month ago. Magistrate Judge William V. Gallo denied bail for Gomez. According to his lawyer, this could change if Gomez’s family members who live in the U.S contact the judge about Gomez staying with them during the legal proceedings, the Mexican newspaper Milenio reported. Milenio also reported that Gomez had been reported missing last week in Tijuana after he missed soccer practices. The newspaper said his photograph had been circulated on social media.